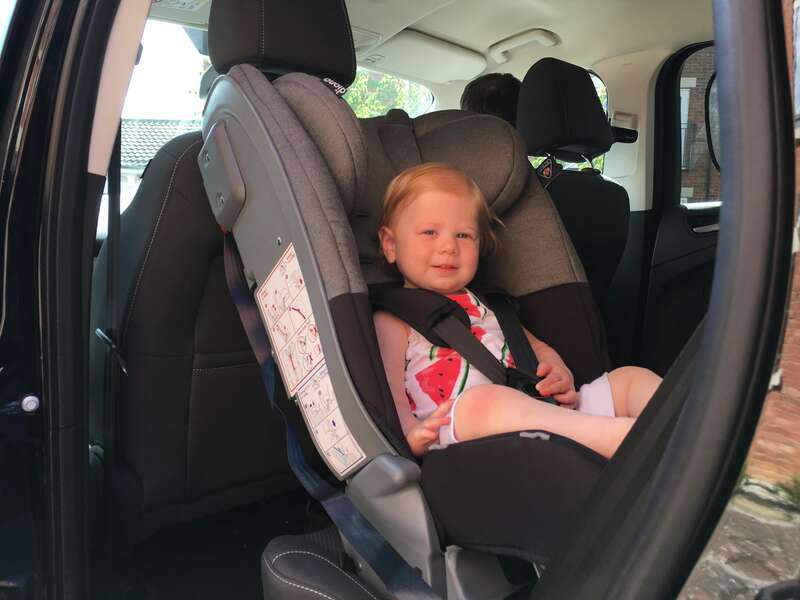 Around a month ago we were sent the Diono Radian 5 car seat to review. I’ve been putting it through its paces; fitting it in different cars and seeing how Little M gets on with it, so I thought I’d share my findings with you! The Diono Radian 5 car seat is designed to be used from birth to 25kg; the weight of an average seven year old. 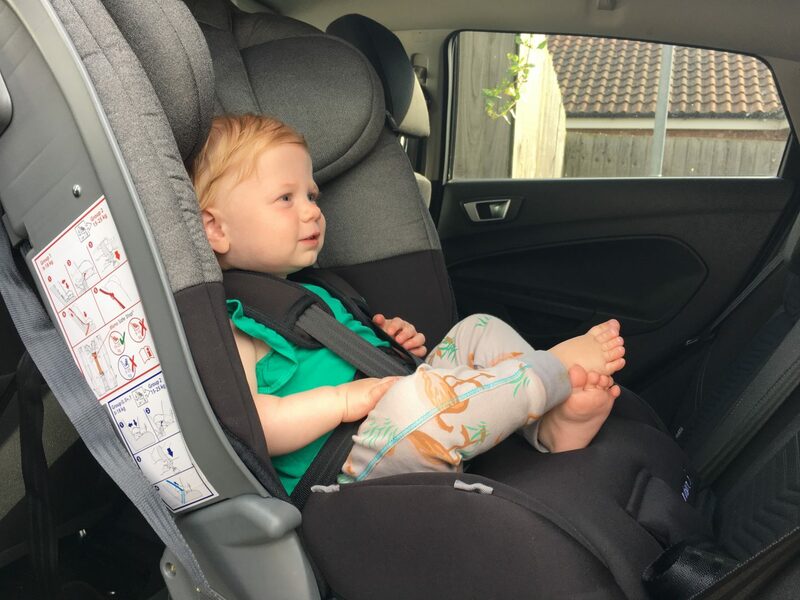 It can be used rear-facing for the duration of its lifespan, as well as forward-facing from 9kg (although the guidance now is to keep children rear-facing until the age of 4). That’s a lot of use out of one car seat! The Radian 5 also has a five-point harness and a steel frame giving it additional strength to withstand an accident, and comes with a lifetime guarantee. Honestly, the Diono Radian 5 isn’t the easiest car seat to fit. I’m used to having an ISOFix base that I just shove into place and away we go; the Radian 5 needs a little more than that. The instructions on the seat and in the instruction booklet aren’t very clear on how to fit the seat safely. I struggled for a while until I turned to good old You Tube and discovered Diono’s fitting video. It’s brilliant and shows exactly how to fit the seat. I’ve embedded it into this post for you to see. The seat belt clip requires a bit of brute force to secure, but once it’s on, it’s on! Extended Rear Facing (ERF) up to 25 kg – more than exceeds currently guidelines on recommended rear facing time. Can be used from birth to 25kg, providing a lot of use for your money. The ability to use the seat both forward- and rear-facing. Thoughtful details like removable, washable covers and a cup holder. 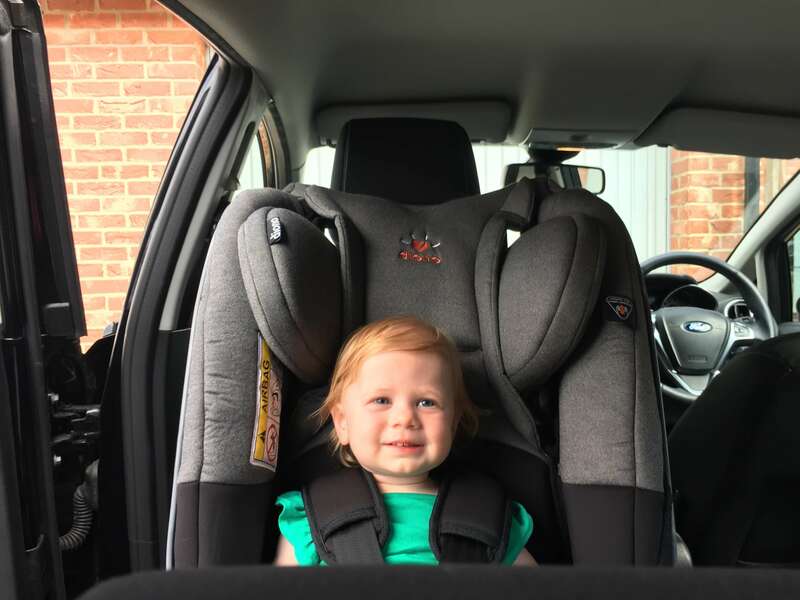 Heavy – I wouldn’t choose this car seat if I needed to switch it regularly between vehicles. Large – in rear facing mode, I found the the front passenger seat needed to be moved almost all the way forward, leaving the front passenger with little leg room. Because Diono Radian 5 needs to be braced by the front seat, it cannot be used behind the driver’s seat or in the middle seat space. 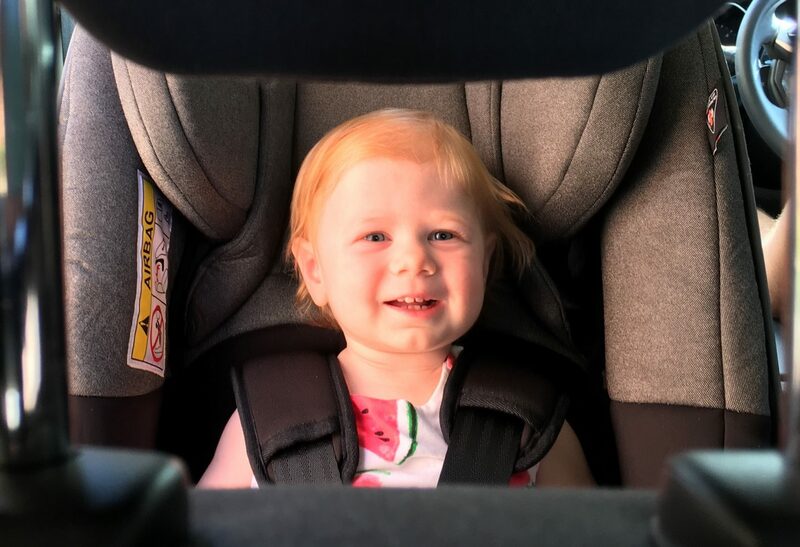 Little M has just grown out of her Maxi-Cosi Pebble Plus infant car seat, so we were looking for a good, extended-rear-facing option for her next car seat. The Diono Radian 5 certainly delivers on that front! As I’ve said above, I did find it tricky to fit, and I think the handbook needs improvement, but once I’d watched the installation video I was satisfied that the seat was fitted safely. We own a Ford Kuga and a Ford Fiesta and I tried the Diono Radian 5 in both. The Radian 5 needing to be braced by the front seat is more of an issue in the Fiesta than the Kuga. Because the Kuga has more space, I still had plenty of leg room in the front. However, I’m not sure I’d want to use the Radian 5 in the Fiesta on a long journey if I was the front passenger. It didn’t leave me with much room at all! But, it did fit. The Kuga is our main family car, so we’re quite happy with the Radian 5 in there. Little M seems really comfortable in the seat; there’s certainly plenty of growing room left in it for her! The five-point harness is comfortable and secure, and easy to adjust. The removable covers are a genius idea, and I’m sure Little M will utilise the cup holder as she gets older. I can imagine it being used for a variety of uses beyond holding a drink – I think it will be really handy for storing little toys or a pot of crayons to keep her busy on long journeys. Overall, a good option if you’re looking for something that’s extended rear facing from birth to 25kg. On their website and fitting guide, it says it can fit in these seats (https://us.diono.com/wp-content/uploads/sites/9/2017/11/Radian-5-Fit-Guide-EU_lowres.pdf) so are you saying this just for you specific situation? On the diagram you link to, it shows little arrows to depict that the seat can be used forward-facing in all those positions. Reading the text, it says, ‘In rearward-facing installations the tether must be affixed securely to the front seat, seat-rail or seatbelt anchorage point as advised in the radian 5 user manual,’ therefore you’d need a seat in front, so it wouldn’t be suited to the middle position. With regard to my specific situation, I found that it wasn’t suitable to be behind the driver’s seat as the position of the driver’s seat needed for the car seat wasn’t the same as the position needed for the comfort and safety of the driver. I’d like to stress, though, that I am not an employee of Diono so I would advise you to contact their customer services so that they can advise you with more authority and certainty.